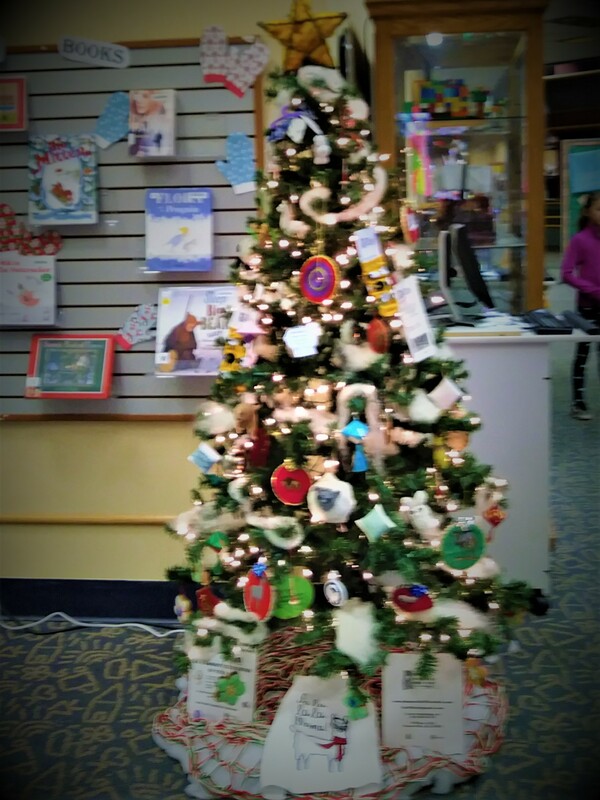 Update: The fiber critters made it to the library and the tree has been put up and decorated. Here’s a picture that doesn’t do it justice so go and check it out yourself. Thanks to everyone who took time to make or buy decorations and those who helped set up the tree. We’d be nothing without our great member volunteers. 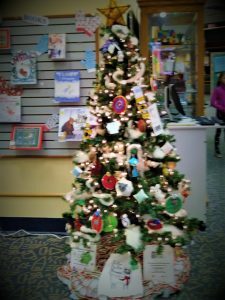 The theme for the 2018 Library Christmas Tree is Fiber Critters. Those of us who set up the tree at the Main Library last year decided that we would like new ornaments depicting animals that give us fiber. We would like to have sheep, rabbits, llamas, alpacas and silk worms on the tree. Make up some fiber animal ornaments and bring them to the holiday gathering at the Madison Library on Saturday November 10th. There will be a prize for the most creative fiber animal. Don’t know how to make animal ornaments? Contact the guild or we’ll have instructions for some fiber animal ornaments for you to make available at the holiday gathering. We’ll need all donated ornaments for the library tree by tree decorating day the end of November. Donations are needed for door prizes to be given away at Roc Day 2019. This year to show off the creativeness of our members, we would like donations of fiber items you have made to use as door prizes at Roc Day. If you have some fiber creations would like to donate, contact the guild or bring them to any guild meeting or event by January 1. Please include a card with your name as donator, item description, process used, i.e. knitting, crocheting, weaving, spinning, tatting, etc., types of fiber used, and care instructions if applicable. The card will be included with the door prize given way at Roc Day. This is your chance to show off a little and get some recognition for the beautiful work you have done.